German singer; born at Berlin Nov. 6, 1855; son of David Kalisch, founder of the "Kladderadatsch." Kalisch was destined for an architeet's career, but at a gathering at the home of his brother-in-law Paul Lindau, where Kalisch sang a few selections from Schubert and Wagner, his voice so impressed Pollini and Adelina Patti that they urged him to go on the stage. Shortly afterward Kalisch went to Italy to study under Leoni and Lamperti, and he made his debut at Varese in 1880 as Edgardo in "Lucia di Lammermoor." After a most successful tour through Italy and Spain he sang in 1883 at the royal operas at Munich, Berlin, and Vienna, and at the Stadttheaters of Hamburg, Leipsic, and Cologne. He stayed a short time in Germany, and then together with Lily Lehmann, whom he later married, went to London, where he sang in "Tristan and Isolde" at Her Majesty's Theatre. From England Kalisch went to the United States, where he spent six winter seasons: four seasons at the Metropolitan Opera House, New York, while for two seasons he toured the country together with Anton Seidl, singing in many of Wagner's operas. Upon his return to Europe he again toured Germany, and also sang at Vienna, Budapest, Paris, and London; but he achieved his greatest success at the "Wiesbadener Festspiele, where he sang before the royal family. He was made "Kammersänger" by Duke Ernst of Saxe-Coburg. Kalisch's most successful rôles are The Prophet, Eleazar, Othello, Siegmund, Siegfried, Tannhäuser, and Tristan. 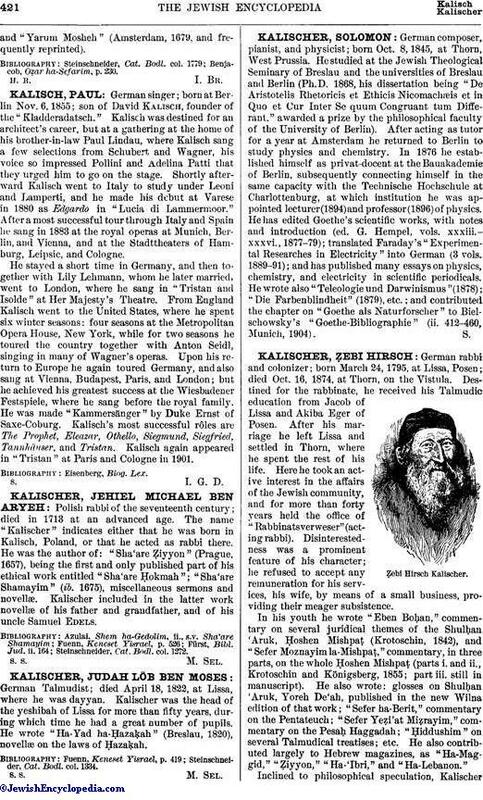 Kalisch again appeared in "Tristan" at Paris and Cologne in 1901.